Home→Our Journey→On the Road→What a difference a day makes! 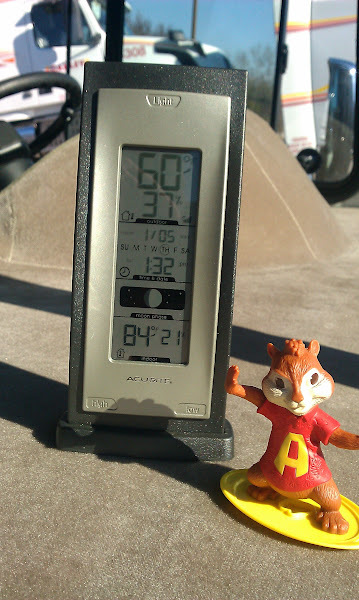 Yesterday in the 30’s, today as of arrival time at the Oaks campground, it was 60+ degrees! Woo Hoo! At 3:00 in the afternoon, the windows are open and being the optimist that I am, I removed the winter lining from my rain coat. I’m ready to stash the two supplemental electric heaters we have (electricity is “free”, propane is not) but Rob says “not so fast – it still can get cold at night!” Darn, I guess he’s right since tonight it is supposed to go down to about 35 degrees. We left Freightliner around 9:15 am this morning after using their dumping station, hitching up the van, etc. Headed out on Route 85 past the glorious Giant Peach. Just outside of Spartanburg, we stopped at the Peach Blossom Diner (seems like everything here has the word peach in its name) for breakfast which was better than expected. You know you are in the South when they serve grits instead of home fries! Last winter I never acquired a taste for grits but this morning once they were drenched in not so healthy butter, sprinkled with salt and pepper, they were actually pretty tasty. It’s probably one of those things that if they are prepared right, they taste good, otherwise, yuck! Who knows maybe I’ll become a southern gal yet! Though I guess I’d have to work real hard at developing a southern drawl to replace my Boston twang! We left the diner around 11 am. After continuing a short distance on Route 85, we eventually picked up Route 26 right outside of Spartanburg and pretty much stayed on that all day until we exited onto Route 95 near Santee. Rather than driving for 6 hours, we opted to have a short driving day, only traveling about 228 miles in total. After a pretty uneventful drive we arrived at the Oaks at Point South campground in Yemassee, SC which is not too far from Beaufort, SC and north of Savannah, GA. 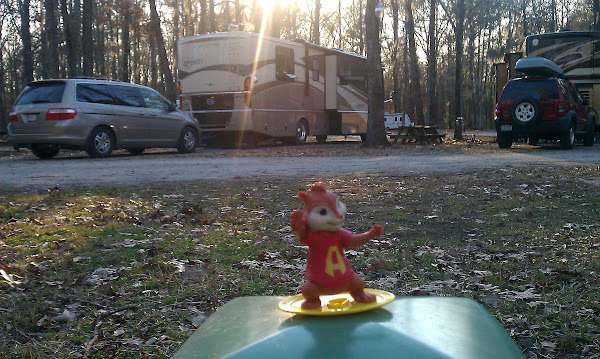 The campground isn’t anything great, lots of oak trees (complete with Spanish Moss) which makes maneuvering our big rig a little challenging but the price was right since it is part of the Passport America network. 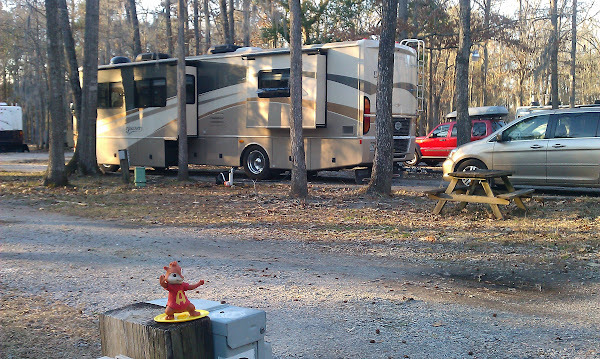 Members of Passport America (which we are) receive a 50% discount off the usual rate but a lot of the campgrounds have restrictions (no weekends, no reduced rates between October and May) so usually you can’t get the discount. So our rate ended up being $24 a night including the dubious $3 “resort fee” (I certainly wouldn’t classify this as a resort) and tax. I can’t imagine paying the full price for this place, nevertheless it is a good stopping point and very close to the interstate. One word of warning, don’t follow your GPS! Use the written directions and turn right onto Yemassee Street at the Waffle House. We’re only here for one night, then we might be going to Jekyll Island but we still haven’t decided yet. There is WiFi here but it looks like it is an extra fee so we are just using our Verizon MiFi which has a marginal but usable signal. The sprint signal is between 0-2 bars but seems to be working at least as good as Verizon. OTA TV is not good with just NBC and PBS but that’s not a big deal for us. The AC voltage is strong, but the water pressure seems a little weak. The sites are fairly heavily treed and plenty long enough for the entire 62’+ rig but are narrow – even so there is enough room for the slide outs. Maintenance here seems like it leaves something to be desired, it could be a real nice spot with some spiffing up. Note: don’t take site 31 if you want to leave the toad attached – it will be 30-35′ stretch to the sewer head. We got this site and decided to move. The boys are enjoying being here – there are lots of squirrels running around so they are totally captivated by them. Even though they are still hiding while we are driving they are getting better – when we stop for a quick break as long as we shut the motor off, they come out of their hiding places pretty quickly to stretch their legs. Tonight we’ll have our leftovers from the Carolina Cafe. Another night of night not having to cook….ah, life is good! Until tomorrow……. Interesting narrative. Keep up the good work. Just caught up with your last 3 blogs. We’re packing continually and I am washing and drying continually, and I still am not bringing all our clothes!!! Most of the dry goods are in the RV but we’re holding off on anything freezeable, so the bags are sitting in the sun room just waiting to be packed away. Our current schedule is to leave Mon. 1/9 and stop in Clarksboro, NJ, second stop is Roanoake Rapids and then, wherever. We will be in Moore Haven, FL by Friday, hopefully, for one weeks, then on to four friend, Ramona, in Port Richey until Feb. 4, and from Feb. 4 to March 4 we will be at Linger Lodge Campground, and after that we will be travellers (gypsys). Travellers is what the Irish gypsys are called.